Viking Delicacy Gold is an enzymatically inactive light brown malt, rich in melanoidins. 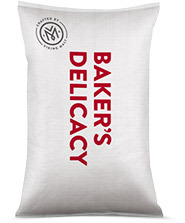 It is produced of 100 % pure malting barley and has a characteristic malty flavor. The flavor of Viking Delicacy Gold is sweet and caramel like, with traces of toffee. Viking Delicacy Gold can be used in recipes to enhance the rich sweet and malty flavors. It also contributes with color, giving a nice light brown hue. Recommended dosage rate is up to 15%. Sweet and caramel like flavour, contains no colourings, preservatives or other food additives.